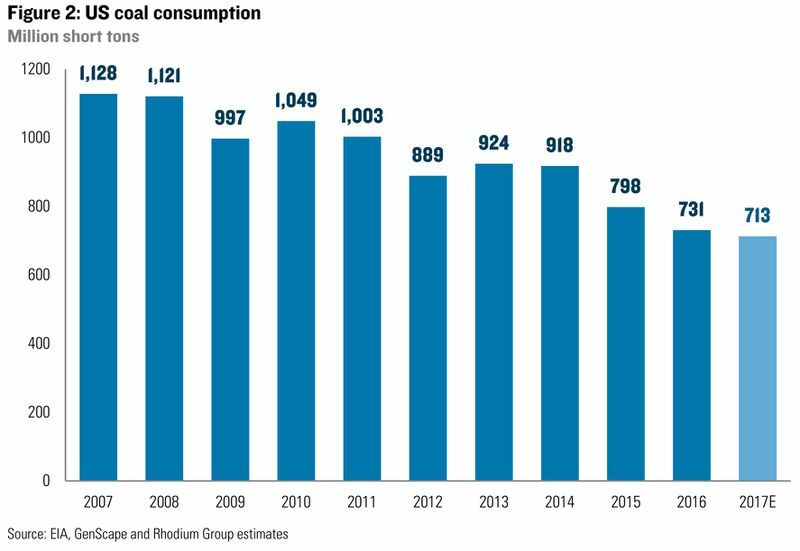 “Between 2006 and 2016,” according to the Rhodium Research group, “US coal consumption declined by 34 percent and production fell by 37 percent. US Coal use continued declining in 2017, despite Trump policies. 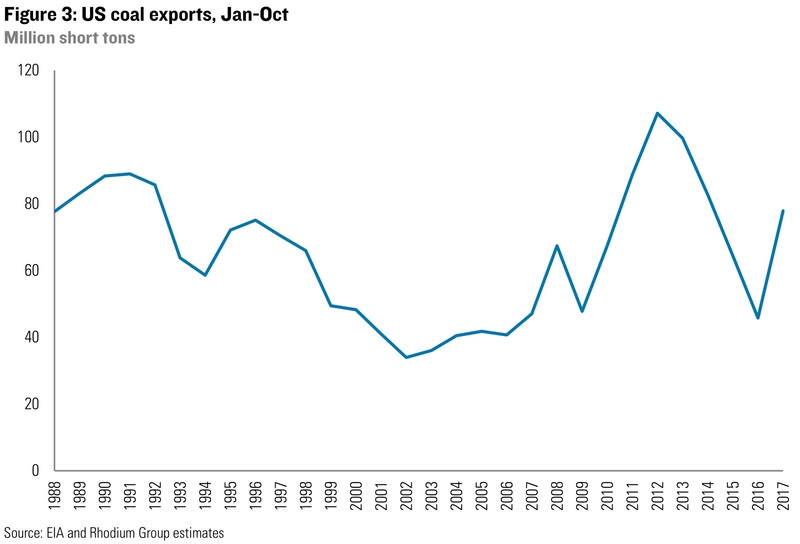 However, US coal production picked up 6% because of exports, while Chinese and Australian coal exports were down. Coal use is higher during winter months when natural gas prices spike, something used by the industry to tout the usefulness of coal. 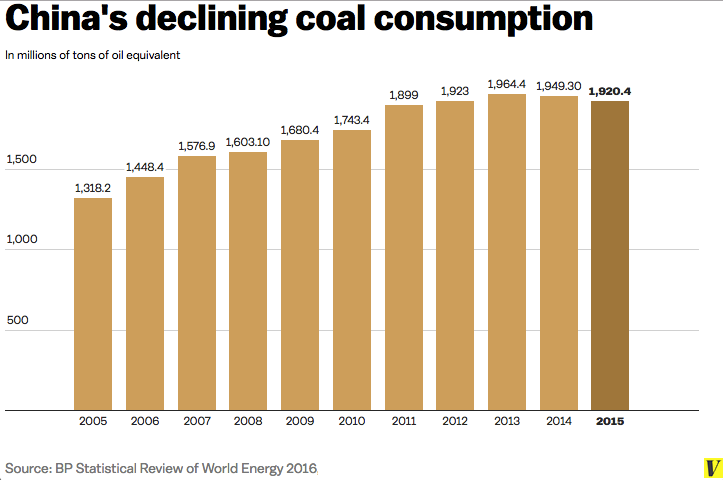 But that ignores the overall decline in coal use that continues during the rest of the year. For source & more, click this link. The generating capacity of US coal plants peaked at 317,649 MW in 2011 and but fell by 14,343 MW to 303,306 MW by 2013–lower than any year since 2003 the earliest that data was available. 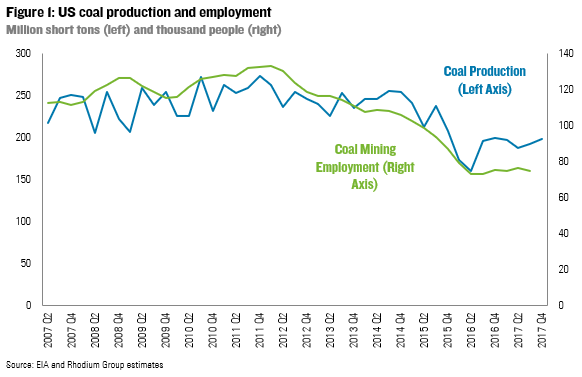 About half of the 2017 gains in coal jobs will be wiped out if the 4 West Mine in Pennsylvania closes in the summer of 2018 as scheduled, laying off around 400 coal workers. It is worth noting that the Bureau of Labor Statistics puts the seasonally adjusted number of coal workers at 50,000 rather than 75,000. “Washington state may play critical role in future of Colstrip power plants,” Link to article by Mike Dennisen. Clean Coal Kaput–In August 2017, the Kemper power plant in Dekalb, Mississippi, announced it would lay off 75 workers at its mine, and possibly as many as 250 workers in the energy plant as a whole. The plant was designed to be the country’s first so-called “clean coal” facility, gasifying coal and capturing and storing much of the carbon dioxide released when burning coal for power. In June 2017, the plant, 4.5 billion over budget, said it was stopping its work on clean coal to burn natural gas, in part for cost reasons. In early July 2015, Alpha coal company announced it was laying off 292 workers in 6 mines and a processing plant in Virginia and Kentucky. Unfortunately those workers will not have the same enhanced unemployment and retraining benefits that this I-184 Initiative provides for displaced fossil fuel workers. Used by permission of Gary Braasch. Click picture to enlarge or here to link to more pictures of coal mining/use. Over the five years prior to 2015, 300 U.S. coal mines shut down, more than 200 coal-fired power plants closed, and 25 coal companies went bankrupt. Miners in the last union coal mine in Kentucky pulled their last 10 hour/4 day a week shift in September of 2015. That leaves Kentucky’s non-union miners to do long hours 6 days a week. Nevertheless, during that time top executives at the 30 largest fossil-fuel companies in the United States made nearly $6 billion. That’s twice as much as the US pledged to the Green Climate Fund, an international financial institution intended to help poor countries respond to climate change. Letting coal company execs “fly” while downsized fossil-fuel workers scramble to replace their jobs is not just. Alpha Natural Resources a coal company went belly-up. It convince the bankruptcy judge to grant $3.4 to $11.9 million in bonuses for 15 top executives while asking the court to cut medical and life insurance benefits for 4,580 nonunion miners and their spouses and making 6,670 active employees ineligible for retirement benefits. While I-184 likely would not help workers in similar circumstances, it provides pension benefits for Montana workers when defunct coal companies can’t make good on previously promised pension benefits. Link to this news report. “Major U.S. coal producers, such as Peabody Energy and Arch Coal, have seen their market values drop by 61 and 94 percent, respectively, as of September 2014. “The Stowe Global Coal Index – a composite index of companies from around the world whose principal business involves coal – dropped 70 percent between April 2011 and September 2014. To those who wonder whether our doing anything will matter because they don’t know what China is doing, you can tell them, “In Paris, China pledged to develop 800 to 1,000 gigawatts of new renewable energy capacity by 2030 — the equivalent of the entire US electricity system,” according to David Roberts. Capacity factors for wind turbines, while improving with increased tower height and technological innovation, are less than capacity factors in other generation, so it takes more MW of wind turbines to produce the same amount of electricity as a MW of fossil fuel facilities. Nevertheless, some of this new green electricity capacity is replacing fossil fuel generation that has been and is being shut down. To help alleviate the health effects of burning fossil fuel, please click the picture to let us know you will sign the paper petition supporting I-180, the 80% renewable electricity by 2050 initiative if we contact you. For insight on coal policy in Indian Country click here.